That’s always been the nut for Rob Monte, who took every show, hell, every song to be a long walk to the gallows, as if tomorrow was a rumor and squeezing every last inch of a Saturday night meant a little bit more than everything. There is weird blood running in the man’s veins, much of it tainted with alcohol and the gripping fear that someone in his presence might not be having the time of their lives. It’s a rough gig spending nearly an entirety of an adult life convincing audiences that infinite merriment is tangible while the clock has other ideas. And the “figuring out” is what made the incredible professionals Monte has played with over the years so fascinating. There are far too many to name here, but know they are brave subjects in an improbable conquering horde of weekend marauders just the same. Monte’s story is hardly unique. It is but one of thousands played out across this great land, where somewhere tonight there are hard-bitten dreamers tossing about elusive glories in cover tunes and original numbers; piano troubadours and harp-mouthed folkies and jazz cats and sing-song beauties putting on one more show for one more dollar and one more round of applause. But here in New Jersey, when a man steps down from his well-earned throne as King of Long Beach Island, it is pretty big news. For the mythical, radical, hysterical place I once called Clubland in my book, Deep Tank Jersey, it is monumental. As far as icons go, if there is such an animal trolling the sordid corridors once inhabited by the likes of Bruce Springsteen and Bon Jovi, Rob Monte sure as hell is. He has fronted several bands of varying degrees of reputation and earning power for the past two decades, the most lucrative and history making is DogVoices, the birth of which during its most lavishly successful summer is depicted in the aforementioned book by yours truly. Therefore, Monte’s swansong is also a somewhat selfish personal tribute for this space. It can be argued that without Deep Tank Jersey and the wild events of the summer of 1995, the access and honesty of the original five members of DogVoices, and all those clubs and roadies and fans and wonderfully colorful hangers-on, there may not be a Reality Check News & Information Desk. So blame the whole damn thing on Monte, who was foolish enough to allow the sordid tale of young men treading the floorboards from Atlantic City to Clifton to be recorded for posterity. Lord knows it is hard for me to believe a word of it today, and I wrote the damn thing. Worse still, I lived it. Barely. Like most of the poor souls who stepped into a Jersey Rock Club looking for a good time but were assaulted with a strange combination of burlesque and mud wrestling soaked in gallons of beer and sweat. Rob Monte the ringmaster of it all, from midnight ocean dives to launches from the odd hotel roof, impromptu strip shows and Tequila-shot binges, bar dancing and a rabble of dawn seekers thrown into the spotlight for an inch of what Monte has come to call home. It is a home he never takes for granted as he continued to review his incredible run at a pace that would have killed several if not all other men not named Keith Richards. Along with the Ringside, a modest but hopping rock venue in the hamlet of Caldwell, there is the now-defunct Wally’s and Nickel’s Alley, Wild Mike’s, the Wreck Room, and the legendary Mother’s, all of them outlasted by the unsinkable Columbian Freak Boy. 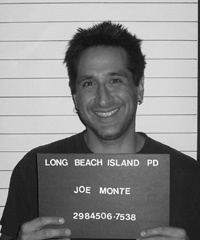 The center of Monte’s universe for nearly 20 years has been Long Beach Island, known to many in the tri-state area as an interesting amalgam of quiet, sunny family getaways and completely maddening midnight parties, the latter of which became the central force in an impressive career of playing popular songs of the day with a splash of carnival folly. “The Quarterdeck, Sea Shell, Nardi’s, Joe Pop’s, you could play over four days without ever leaving the island,” Monte chuckles, as if struggling to recall earlier triumphs. Now, placing it all into perspective, he can securely move into a fulltime career mentoring younger bands with his newly formed Monte Booking Agency, where the man himself tutors his acts to steer clear of the Monte Method. And what about any parting words, a final stage dive or perhaps a Daffy Duck self-immolation jag? Whatever it will be, its toll will end one part of an implausible career, close an era, and provide another reason for those who were there to recall the past. For me, I wish good luck to my friend, a long-gone protagonist in my first published work. And good luck to the rest of the Weird Blood who dare scour the depths of what is left of the Deep Tank. At The Sea Shell last year James Champion was in attendance as well as Rich Monte selling books. I was there and remembered Dog Voices from the nineties but in particular in ’95 my husband n I were there for our 1st wedding anniversary and the band made a BIG FUSS…over the top AWESOME!! I never forgot it and niether did my husband – God rest his soul, but WE LOVED YOU! Anyway, last summer Monte and James signed my book and acknowledged my Tony in it. That made the book a treasure to me (besides the content) and It will go with me when I go home to be reunited with my husband, the love of my life!